Red is more versatile than many people think. While people may not want to paint an entire room in bold shades of red, there’s something to be said for using this color as an accent throughout a home, resort project or other commercial building. In fact, glorious Rojo Alicante tiles may be the perfect finishing touch for your next major job. Before you place an order for traditional white or beige tiles, consider how you can incorporate this incredible marble into your new designs to impress potential customers and help close sales. People walk into bathrooms expecting to see neutral tones with perhaps a splash of color. However, you can surprise them with something truly impressive by going with red tiles. Don’t be afraid that you’ll overwhelm the space because you can use them as borders and incredible highlights. Choose tan tiles for most of the project to keep things feeling neutral and for the way the colors play off each other and warm up an entire room. Have a white or tan vanity topped with this marvelous shade of red. The top edge of the whirlpool bath can be finished in the same marble for durability and consistency. Finally, carry the pattern through the entire room by making a chair rail out of red tiles. Let the border drift through the shower area and around the entire room for a finished look and an impressive feel. Accents and towels in white with red borders will look sharp, and you can add a touch of metallic color with gold or chrome bathroom accessories. Tile backsplashes are all the rage now, and they’re not likely to fall out of favor anytime soon. Your customers love the look of beautiful tile against the walls, and they appreciate the low maintenance and durability of this finish. As a designer and contractor, you may prefer to go with neutral colors in this area, but there are times when deep red is the right choice. Red is a hot kitchen accent in this modern era, and you can find everything from red mixers and bowl sets to red faucets. Play off this trend in your commercial kitchen design by putting a stunning Rojo Alicante marble finish on the area above the stove. This marble is streaked with natural veins of white or tan, and those colors will work together to make any stainless steel appliance stand out. You can match the counters to the incredible backsplash or go with a coordinating shade. Finish out the kitchen with some matching marble accents and brilliant red accessories. Red marble is a bold color choice that works in almost any space. Many designers use it as an accent or border to highlight attractive features. However, you can be more daring. When working with an individual who wants something bold, Rojo Alicante is the top choice. Create a wall of red tiles in the foyer to make a great first impression on guests. Use is as the treads for a marvelous stairwell that deserves to be center stage. Install it on the bathroom floor to make the room feel larger and ensure that your clients will be impressed. You may be surprised at how well this color works in a large area, and you can easily coordinate it with darker wood tones for a monochromatic look. You can also break up the field of red by mixing in tiles of deep black, neutral tan or even bright white. One option is to mix in smaller tiles with larger ones for a scattered pattern, or you can create the checkered look with beautiful red and elegant cream. Mixing in other colors makes the red tones feel deeper or softer, and can draw more attention to the lovely pattern you’ve worked so hard on. One clever design option is to use mirror images of this tile. A simple shower stall with glass enclosure can feel bland and dull. It won’t stand out to clients or make anyone take notice if you don’t give it a special touch. However, you can add color by putting Rojo Alicante tiles on the floor. On the wall with the showerhead, create a large field of red marble tiles that mirror the shape on the floor. The overall shape and dimensions may differ, but the effect will still be impressive. Leave a border of contrasting tiles around the wall tiles and on the other sides of the shower. The entire fixture will stand out and become the centerpiece it deserves to be. If you want the stall to be the focal point, then limit your use of the red tiles to these two fields. Smart builders appreciate the value of mosaics, medallions and other decorative areas. Creating a pattern that closely resembles an area rug is a fantastic way to impress clients and provide them with the sophisticated look they expect. Deeply colored tiles are perfect as the center area for these artistic touches because they draw more attention to the area and perfect the look of a faux rug. Create a border around the red marble to finish the illusion. You can also use the red marble as a border for a complementary color in the center if you want to make the accent look larger. When creating a floor pattern, understated finishes are sometimes the right choice. A solid floor of red might be overwhelming in some cases, but inset diamonds that add visual interest and just a little color may be the right choice. Cut the Rojo Alicante tiles down and use them a part of a subtle pattern that’s appropriate for any room. Tie everything together by using the same red tiles as a window sill, countertop or even door threshold. Rojo Alicante tiles are readily available from Nalboor. We carry these maroon toned stones in stock, and we also offer special orders. The highlight veins in cream and brown mean that this finish will work with almost any other color you choose. It looks great with natural wood furniture, sleek white marble and even metallic accents. When you want to stand out from the competition and ensure that clients take notice of your work, this is an excellent accent choice. 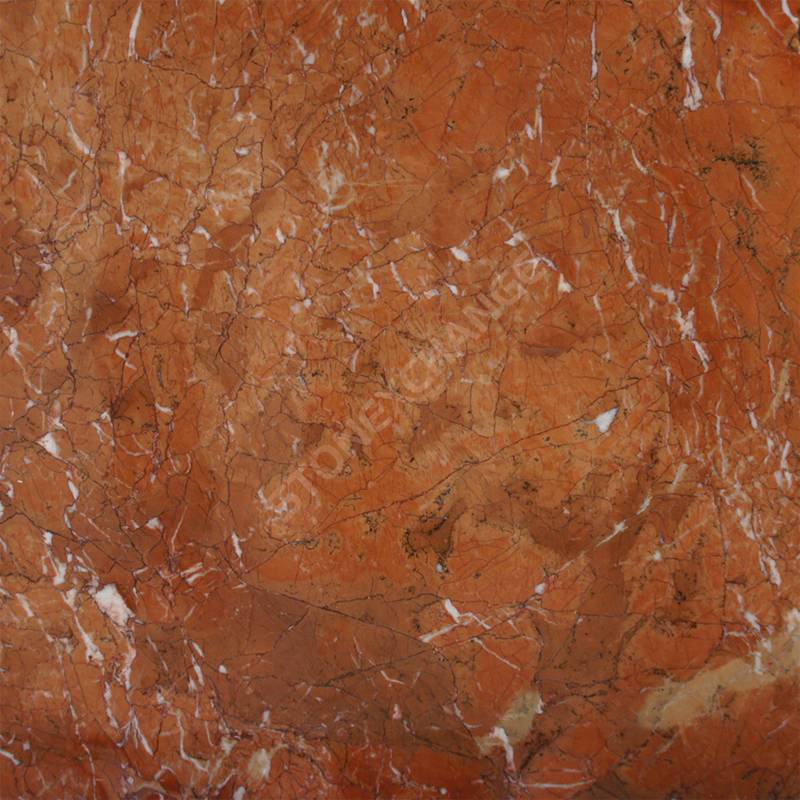 You can also go bold by filling a room with this marble and letting your customers bask in the elegant feel. We offer wholesale pricing on this durable product, and our customer service professionals are standing by to answer any questions you have. There’s always a place for Bianco Dolomiti tiles and marvelous Shell Reef limestone in your projects, but you’ll also find that Rojo Alicante deserves a spot in your design plans. Contact us today to see about placing your order today.